Nutricia Pharmaceutic (Wuxi) Co., Ltd. was formed in January, 2000 after its parent company acquired a pharmaceutical company in Wuxi. Located at the Wuxi New District, Nutricia (Wuxi) is a solely-owned foreign enterprise and the first manufacturing base for enteral nutrition products in China, with a total investment of $65 million and a registered capital of $25.83 million. It covers an area of 46,000 square meters. 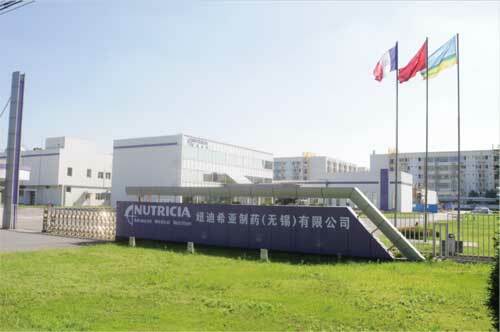 Nutricia (Wuxi) operates under GMP, ISO9001, ISO14001 and ENISO13485 operation systems and is the first manufacturer in China that exports enteral nutrition products and delivery systems to Western markets. It is an international supplier in this market, building a long-term partnership with its customers on a global scale, with its products being distributed in Europe and other regions across the world. Many of them are world-renowned enteral products, such as Nutrison Liquid, Peptisorb, TPF-DM, TP-MCT and their auxiliary pipes and pumps.